When some tribesmen in an African village stage an insurrection, the President of Africa (yeah, that’s the ticket…) calls in some foreign White Devils to quell the rebellion, presumably to distance himself from all the local killing and destruction. Vietnam vets T.J. Christian (Brown) and Cliff Taylor (O’Neal), along with Wilson (Mitchum) and some other guy are under the command of Virelli (Fonda), also a ‘Nam veteran. However, as some of our “Mercenary Fighters” come to know the people of the land they’re now in, alliances and allegiances change. Will they Fight to the finish? 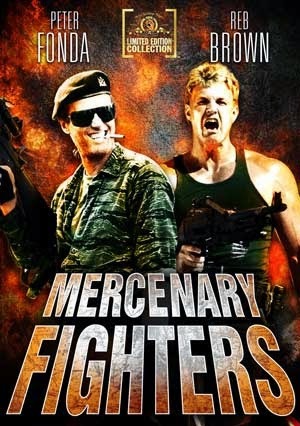 We can safely say that Mercenary Fighters is…something you’d find in a video store. At least back in the golden age. Its overall mediocrity ensures it being standard shelf-filler, or, perhaps more accurately, “Cannon fodder” (heh heh. Has anyone ever used that one before?) Nevertheless, the movie contains all the standard stuff we’ve come to depend on: explosions, exploding huts, exploding guard towers, guard tower falls, jungles or jungle-like locations, and plenty of shooting. Peter Fonda has a big gun that is a one-shot hut blower-upper, and most of the war violence occurs during the final battle. It is also at this climactic moment that we finally get to hear Reb Brown’s time-honored “Reb-el” yell. He even gets so deep into his screaming, he does practically a whole dialogue scene in a helicopter, let’s just say, not using his indoor voice. 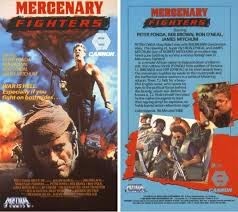 While Reb’s shoutings were apparently such a selling point in the 80’s that he’s even seen screaming on the front cover of the VHS (apparently by the late eighties they had really caught on), Peter Fonda’s silly hair is NOT front and center on the box art. It’s obscured by a mysterious hat. His long, scraggly locks seen in the film seem to be a leftover from his more hippie-ish acting roles, but on a dime about halfway through this film, he snaps into a tough commander role, as if he woke up midway through the production and realized he was supposed to be tough this time around. Even though Mercenary Fighters on the whole is fairly middling, no one can accuse it of shortchanging us of our favorite stars. Besides Fonda and Brown, we also have Ron O’Neal – even though the credits misspell his name as “O’Neil” – and yet another fan favorite, Jim Mitchum. Mitchum here is classic Mitchum. Mitchum. He wears a shirt that says “Bad Boy”, when he’s not wearing a Hawaiian shirt, and is never seen without his Walkman. If it was somehow possible to not shave for 25 years and not grow a full beard, that’s how his face looks. Surprisingly, his mellow performance would indicate he might not care too much about the proceedings. On the whole, we’ve never cared too much for what we call “Africa Slogs”, and this is certainly one. Truly this movie is no Red Scorpion (1988), the exception that proves the rule. Despite getting to see some of our favorite actors all together at once, and some decent war violence, somehow, Mercenary Fighters left us unsatisfied. Once again, I agree. I expected more from this movie. It had great South African locations, and a storyline similar to Red Scorpion, which could have worked out very well. I bought it after watching its awesome trailer. In the end, however, it turned out to be the quintessential jungle slog. Filmed in 1986, but released in 1988. Roger: Totally agree, this was a disappointment. We wished this was better. Ivica: Haha! Maybe he does. Thanks for your comment. I tend to like action films set in Africa, Danger Zone is by my favorite one. Danger Zone has Robert Downey Jr's best performance. Haha. He should go back to making DTV product.